On the latest episode of Reel Shorts, guest critic, Cynthia Fuchs of PopMatters reviews the neo-noir thriller crime story, Dead Man Down. “You should ask him out,” Valentine (Isabelle Huppert) says, “Live your life.” Watching her daughter Beatrice (Noomi Rapace) watch Victor (Colin Farrell), Valentine makes the kind of assessment you’d expect from a movie mom. She means to encourage Beatrice, who is damaged. You know this because her face is scarred, following a car accident two years ago. And Victor, well, he’s damaged too, which you know because you’ve already seen him at work as a hired killer, his face pained even as he demonstrates lethal skills. Valentine is damaged too: she lost her hearing as a child in France. This story comes without detail or lament, and even serves as a bit of a joke and couple-bonding device, as Beatrice reveals to Victor that she’s hidden her mom’s hearing aids in her hand, so Valentine can’t hear what they’re saying. That Valentine handles her damage without drama makes her different from everyone else in Dead Man Down, as unthrilling a thriller as you can imagine. Valentine brings light and, such as it is, a bit of that life she urges her daughter to live. She has her toenails painted, she bakes cookies, and she wears cleansing facemasks. What Valentine does not do is hear the central plot, in which Beatrice blackmails Victor into killing the drunk driver who caused her damage, using a cell phone video she’s taken of him killing a man in his apartment. You might wonder why a professional killer who is killing a man in his own apartment in New York City would leave his curtains open so the crime might be fully visible to neighbors like Beatrice. You might wonder as well why Victor would even consider agreeing to her scheme, which she announces during a frankly lunatic first date—the one that occurs when Beatrice follows her mother’s advice—where he’s driving and she’s threatening and his pickup truck is careening in city traffic. His agreement, like the open curtain, is the sort of contrivance that makes this movie go, a preposterous one. For his agreement is premised in his sympathy for Beatrice’s situation, as Victor too is seeking revenge in a decidedly elaborate way. His vengeance plot is the reason he’s currently working as a killer, for Alphonse (Terrence Howard), because Alphonse had a hand in the murders of Victor’s much-missed wife and child (you know they’re much-missed because he watches a short video of them again and again, the images flickering on the curtains in his apartment that are, again, not covering his windows.) You might wonder how Victor—an engineer of some kind—is able to pass himself off as a killer, and so does Beatrice. When she asks, he has an answer: he had military training back in Hungary, which also provides his connection to his mentor, the Hungarian gangster Gregor (F. Murray Abraham), as all Hungarians in New York City apparently know each other. Beatrice doesn’t have such connections (no mention of French gangsters here, though there are some bald Albanians) and so she exploits her chance recording of Victor at work in order to achieve her end. Here again, you might imagine that their damages, once separate and now conjoined, might provide a kind of legible structure, but they do not. 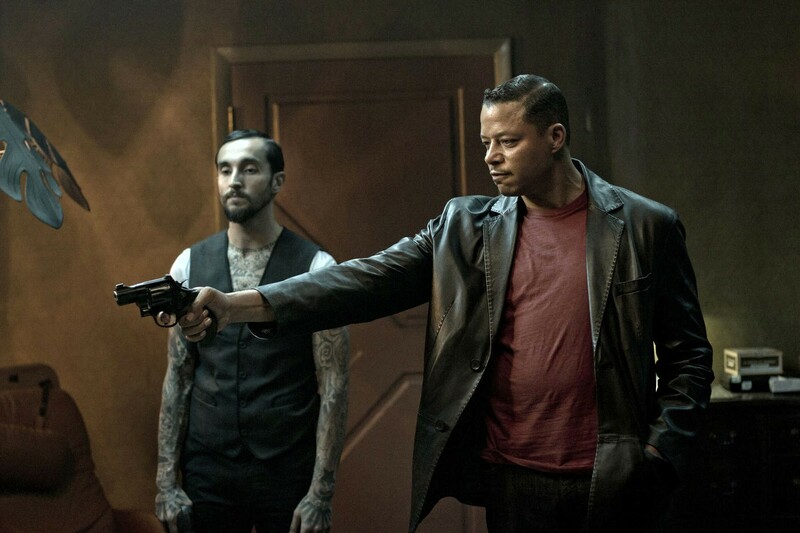 Instead, Dead Man Down never quite stops careening: Beatrice follows Victor on a couple of his own vengeance-plot-points, so she observes a few other murders and even helps him escape from an especially bloody and chaotic scene. When he asks why she followed him, she replies that she’s done it before and that it’s a lucky thing that she did (indeed!). Again, you’re left wondering at what a very bad professional killer he is, leaving himself open to surveillance by an amateur. To read the rest of the review, click here!